The woes of men, women and children who are facing numerous challenges even though the country has a vibrant ‘free’ state health system came forth loud and clear last Sunday. 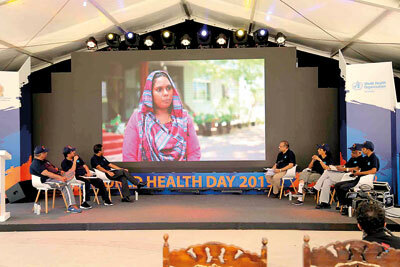 Videos of ‘Voices from the field’ brought the reality of many unable to access health care, to the heart of Colombo city when World Health Day was celebrated on April 7 at the Independence Arcade in Colombo 7, with a drone flying around capturing images of the area. The theme was ‘Universal Health Coverage: Everyone Everywhere’. This was while elsewhere people were having their eyes tested and others were visiting health-related stalls. These “voices” from the field set the tone for an interactive panel discussion moderated by the Immediate Past President of the Sri Lanka Medical Association (SLMA), Dr. Ruvaiz Haniffa, with hard-hitting questions being directed to the relevant panellists. A team from the World Health Organisation (WHO), the College of Community Physicians and provincial health authorities had journeyed the long road, more than 2,000 km, in the month leading up to World Health Day, collecting these “voices”. Lamenting that when the new government took over in 2015, its total income was 11%, Economic Reforms (non-Cabinet) Minister Dr. Harsha de Silva explained that everything cannot be done with this. In response to the first question fielded by Dr. Haniffa as to what measures are hindering an increase in per capita government health expenditure in terms of GDP to at least 4-4.5%, Dr. de Silva said that the government just cannot do it – increase expenditure on health to 4% and on education to 6%. Earlier, Dr. Haniffa had pointed out that the per capita government health expenditure as a percentage of the GDP in Sri Lanka is about 1.6%, which figure is comparatively low, while the Out-of-Pocket Expenditure (OOPE) on health as a percentage of health expenditure is around 50% in Sri Lanka, which figure is comparatively high. Dr. de Silva said “okkama padui” (everything is at a loss) and what the country has to decide is whether certain things can be done or not. The country’s first priority is “naya geveema” (repaying loans). We will need a 20-21% income to meet all the demands. How do we prioritize where to spend? But with all these challenges, health and education continue to be a priority for us, he said, asking the question: Should everyone get everything free? Citing the example of not being able to have the cake and also eat it, Dr. de Silva said that even though the government must give everything to everyone, why should the person who comes in a BMW get an operation costing Rs. 1 million absolutely free at the National Hospital of Sri Lanka (NHSL)? How do we get the BMW guy to go to the private sector? You can’t mandate that – you should have a needs-based system. The higher the income of a person, the lower the subsidy should be, both in health and education. But, he said, Sri Lanka is used to “welfare politics”. The people expect it. Here come the morals and ethics. Isn’t there a social responsibility on the part of the citizens too? Should influential people jump the queue and get their matters attended to? “The government has not been able to implement a means-tested subsidy scheme where we give subsidies to the receiver directly and not the supplier. When it is given to the supplier, the rich people get it and sometimes the poor people don’t. 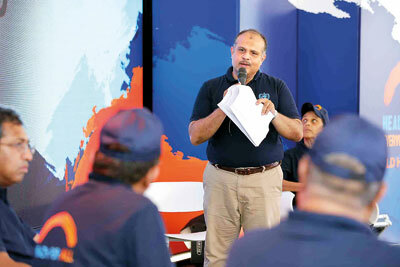 Subsidies should be on a 0 (zero) to 100 (hundred) continuum,” said Dr. de Silva, stressing that Sri Lanka needs a policy shift and “we need the backbone” to do this. The other panellists were the State Minister of Health, Faizal Cassim; the Director-General of Health Services, Dr. Anil Jasinghe; and an Education Ministry representative N.P. Gunasekera. On the podium with Dr. Haniffa were SLMA President Dr. Anula Wijesundara and National Authority on Tobacco and Alcohol (NATA) President Dr. Palitha Abeykoon. After the panel discussion, everyone moved to the ‘lion area’ of the arcade to form the Solidarity Chain as was being done across the world to show support for the need for Universal Health Coverage. Not having services led patients to seek out city/large hospitals and mostly the large channelling centres and private hospitals in the city. These provide specialized care and other services at a cost. 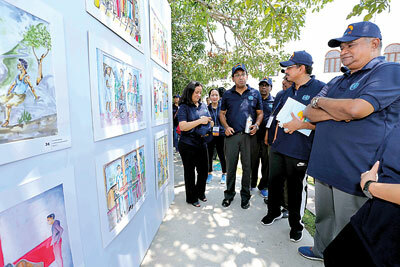 Admiring the children’s works of art – (from left) State Minister Faizal Cassim, Dr. Anil Jasinghe, Dr. Harsha de Silva and WHO Representative in Sri Lanka, Dr. Razia Pendse. 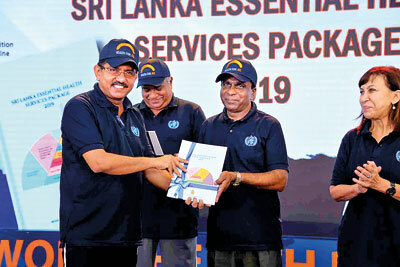 ‘Universal Health Coverage: Everyone, Everywhere’ was also the theme of art sessions organized by the Western Provincial Director of Health Services, the College of Community Physicians of Sri Lanka and the WHO Sri Lanka. More than 600 children from rural and remote schools in the Western Province participated in this art exhibition held under the three categories of Grades 1-5; Grades 6-10 and Grades 11-13. From among these entries, 50 were displayed as an ‘open exhibition’ which was inaugurated by State Health Minister Faizal Cassim and Economic Reforms Minister Dr. Harsha de Silva. 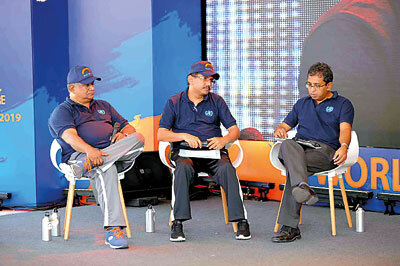 While the inauguration took place after the panel discussion, a live art session was also held on site.